A post about 1960s fashion, especially one about summer fashion, cannot be complete without mentioning the effect of 'the mini'. 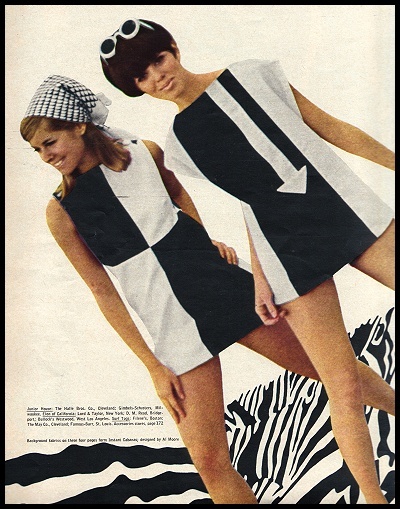 Widely reputed to have been 'invented' by the 'Queen of the Sixties' Mary Quant and continued with Andre Courreges, the raised hemline certainly raised a few eyebrows when it was created by Quant in 1964. With the likes of Jean Shrimpton and Twiggy sporting the mini, the trend quickly spread worldwide. The mini also leant itself very well with the 'Mod' look developed by Courreges, taking the mini from the high street and onto the catwalks. Paired with the trademark white boots, designers such as Yves St. Laurent furthered the mini skirt trend and by the summer of 1966 these mini skirts were everywhere. Summer in the sixties would not have been complete without wearing an item of clothing in bold colours with even bolder patterns! This went for both the men and the women. The influence of Andy Warhol's Pop images and Op art paintings by the likes of Bridget Riley can be seen through the daring prints and patterns championed by designers at the time. It was a time of vibrancy with dresses, skirts, tops and shirts in bright geometric patterns and psychedelic colours being seen across the world. Now, how to complete this sixties look? With a pair of big plastic oversized sunglasses of course! Tying in with the fun and bright styles of the decade, these bright eyewear accessories began to appear on celebrities (such as Jackie O) before hitting the beaches but soon they were a fashion staple. Check out Fashion & Vintage on Barnebys.